After a long planning decided to head to Door County for capturing the palette of fall colors. As I was scouting the locations online, read about Cave Point to be a prominent spot. Being close to the the place where we stayed, decided to head there first thing in the evening to capture some stars. Reaching the spot after sunset did not help navigating in the dark. With the moon scheduled to come up, did not have much time either. I decided to use the moon light to capture the rugged cliff from below. The cool breeze, the sounds of the water crashing against the walls, the night sky … and just as I was exposing for the same, this lively meteor decided to adorn the sky. It took around 12 – 15 seconds to span across the sky before burning off. Given the waxing gibbous moon, I was not even expecting a meteor sighting. I could only imagine how bright it would have been, if not for the moon :) With my wife and kid atop the cliff (look keen), this definitely was a treasure of a moment captured ! Once I came back from the trip. looked up online and identified this as Draconids based on the date and direction. The Draconids owe their name to the constellation Draco the Dragon, and are created when the Earth passes through the dust debris left by comet 21 P/ Giacobini-Zinner. This is one in a million. Beautiful and captivating. Plus the story that goes with it. Thank you for sharing. It definitely was John, Draconid is not something I imagined to capture, given its low peak … and the composition / mood came thru perfectly :) Thanks ! 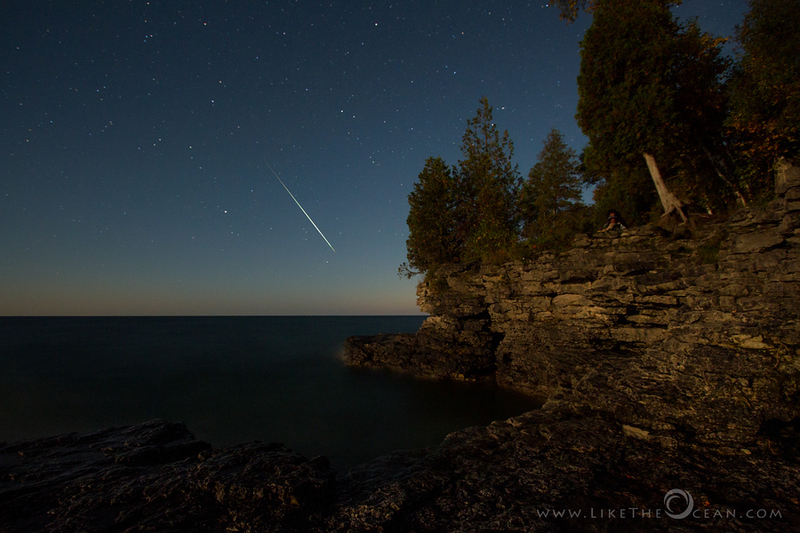 Hi Edith – thanks for the kind compliments :) I was too when I saw the fireball shoot thru the night sky !